People are calling it the "forest bus" and for good reason. Covered in ferns, moss, living flowers and hanging vines, this bus in Taipei is like something straight out of a fantasy film. Fantasy and nature are exactly what the creators wanted passengers to think of when they rode the special, art-installation bus around Taipei, stating that the theme of the bus was "a boy's imaginary forest." Passengers even sit on moss-covered seats! 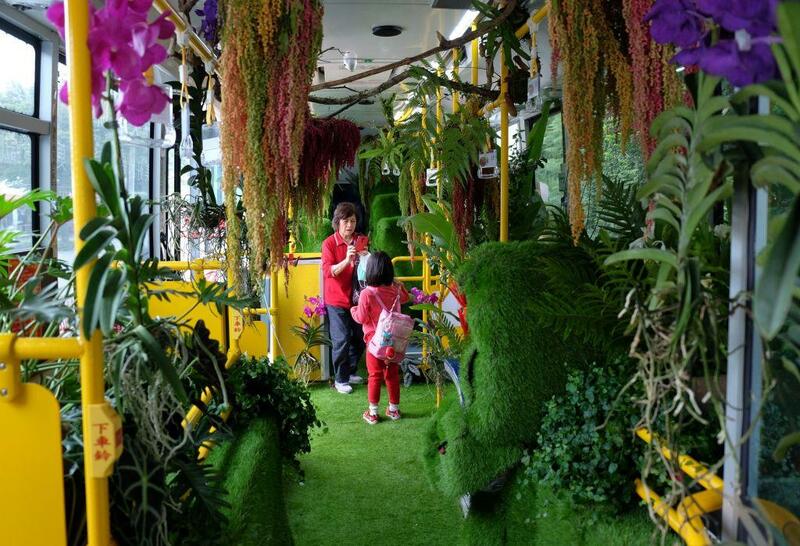 One can't help but be fascinated and charmed by the bus, filled with plant life native to Taiwan. It does, however, bring a few questions to mind. Who created the forest bus? The forest bus, taking the place of the No. 203 bus in the affluent neighborhood of Tianmu, is the creation of florist Alfie Lin and designer Xiao Qing-Yang. Lin is known for designing bouquets which include unusual, native Taiwanese plants, such as ferns and pitcher plants. These plants are sometimes grown by Lin, and sometimes collected from the nearby forests bordering Taiwan. Yang is perhaps best known for being a four time Grammy nominee for Best Record Packaging. He enjoys creating art that is uniquely Taiwanese, believing that much of the art world in Taiwan has been too heavily influenced by outside perspectives, such as from Japan and Western countries. In 2016, Yang released a series of intricate, paper-cut menus for Eva Air airlines, with each design representing a different Taiwanese season. There doesn't always have to be a concrete reason to introduce a little magic into the world! Still, one of the first questions most people ask, whether viewing pictures of the bus or stepping on to ride themselves, is "why?" What inspired the creators to take their vision from paper to reality? For an answer, it helps to know a bit about Taiwan's capital city of Taipei. Although the city has several small parks throughout its many neighborhoods, and even some of Yangmingshan National Park sit within the city's borders, most of Taipei is still very much a concrete jungle. The city is home to about 2.7 million people, most of whom use public transportation to get around. Streets are narrow, buildings are stacked high with businesses atop businesses. It is an interesting, bustling place to live. But it can also be exhausting. Losing one's connection with the natural world is easy when you work long hours (as many city-dwellers do) and have no time to visit local parks. "I hope the public will feel that it’s a beautiful and interesting experience,” he told AFP. “They can smell the scent of summer on the bus and see the vibrant green plants to feel messages from nature." There is also a bit of patriotism behind Lin's idea for the forest bus. "The main reason is I think Taiwan should have its own view on nature," he stated. 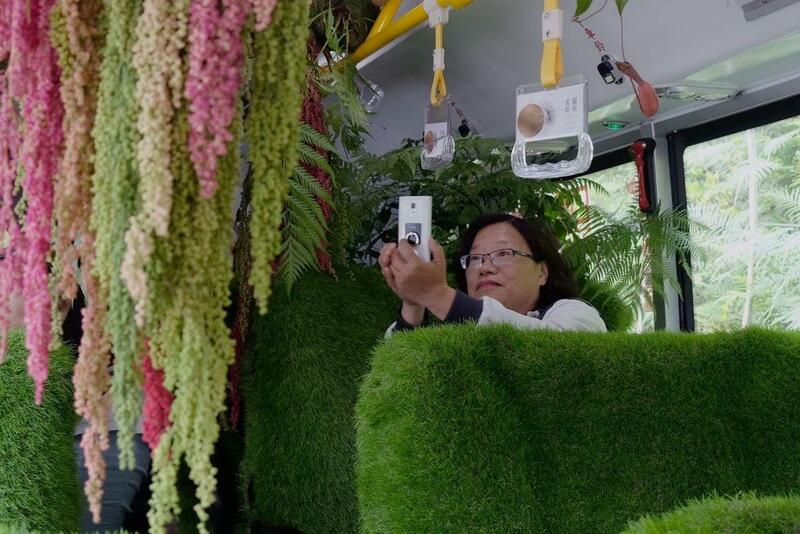 The forest bus ran for one week, from May 24-28th, and the response was overwhelmingly positive--so much so, that many in Taipei are hoping that the bus becomes a permanent city feature. "I feel happy and relaxed on the bus smelling the flowers and plants. I hope it can become a regular service on a double-decker," said passenger Cecile Wei. Passenger Larry Huang, who rode the forest bus at least three times, was a fan of not only the plants, but the overall atmosphere the bus created. “There is no rushing on and off like a regular bus. We chat and take photos for each other. I feel like I’m at a party with friends," he said. The forest bus was free, and ran along a route from Tianmu to Xizhi. Along the way, the bus made stops at locations of interest to both locals and tourists, such as the Shi-dong Market, Taipei Tianmu Baseball Stadium, Taipei Fine Arts Museum, and Xingtian Temple. Making the bus a permanent part of the city might be a great idea, as the bus itself could be seen as a tourist attraction. As Cecile Wei pointed out, "It would become something special to Taipei."